On 11th October all parties involved in trying to help secure the cirl bunting’s tenuous grip in Jersey and encourage it to spread met at Howard Davis Farm to discuss a strategy for the coming winter and next breeding season. Representatives of the Société Jersiaise Ornithology Section, National Trust for Jersey, Durrell, Grouville Tenants, Royal Jersey Golf Club in Grouville and Department of the Environment were present. 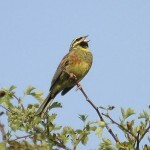 Cirl bunting expert, Cath Jeffs from the RSPB, supplied advice via e-mail in advance of the meeting. 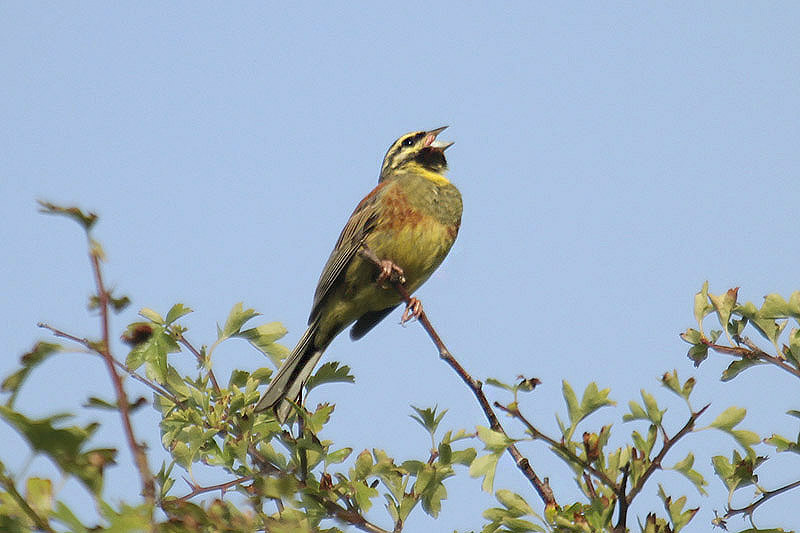 A brief summary of the history of the cirl bunting in Jersey was given including surveys from as far back as 1992 undertaken by the RSPB and Mick Dryden on behalf of the Société Jersiaise. 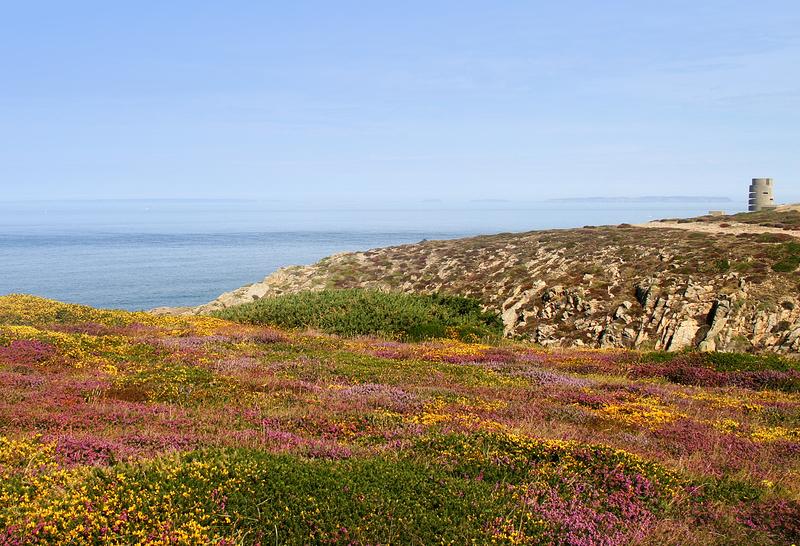 In 1992, 21 singing males had been recorded primarily in three areas: Grouville Golf Course (GGC); La Moye Golf Course; St Brelade area (including St Brelade Bay and Pont Marquet). A steady decline continued from the 1992 survey until 2000 when no birds were seen. There were occasional sightings and reports until 2011 when cirl buntings were found on GGC on the bird monitoring transect that runs across it. Speculation as to why there has been a reduction in cirl bunting numbers has focussed on a combination of factors: they have never exhibited a strong breeding success in Jersey; there have been continued changes in agricultural practices resulting in a loss of winter habitat and feed availability; predation from sparrowhawks, cats and rats. 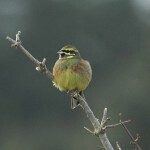 The possibilities for cirl bunting conservation across other localities in Jersey. Current and proposed management of the non playing areas at GGC was outlined including the holm oak removal and gorse coppicing regime. Currently the Royal Jersey are working to a six year rotational plan to cover the whole course and are employing a combination of cutting smaller pockets and larger areas as well as replanting gorse where appropriate. There has also been a general reduction in the cutting regime of the rough across the course which was even more strictly applied around the current bird feeder sites. Grassland management regimes that are in place are designed to reduce the nitrogen load and promote finer fescue grasses. A consequence, however, of not managing the rough as intensively and also the rotational gorse coppicing and holm oak clearance has been an increase in the bracken stand which needs to be addressed. In discussing the management currently being undertaken a number of initiatives being implemented to further enhance the marginal areas of the course and, hopefully, opportunities for cirl bunting and other birds were outlined. These ranged from keeping golf buggies out of the rough across the course and managing access for public and dog walkers in areas. It was also decided to relocate one of the existing bird feeders and to install a number of additional feeders in an area where forthcoming habitat management work is programmed. Should existing feeders be retained in place or moved. Significant thanks were extended to Richard Perchard who has been monitoring the use of feeding stations, sterilising trays and topping up the food through 2011-2012. Birds have been fed the same seed mix throughout. The poor early season (in 2012) weather conditions meant that there was limited availability of grasshoppers (particularly) and there was discussion over the use of mealworms. It was decided that mealworms would be used at the start of the next (2013) breeding season if weather conditions were poor. It was further noted that the availability of grasshoppers would play an important role in the success of rearing young and it may be more beneficial not to leave grass uncut throughout the whole growing season as grasshoppers tended to become less abundant as vegetation became too long or rough. It was decided that supplementary feeding would continue year round for the time being and also to include a couple of extra feeders to be put out on the course. Discussion about changing the location of feeding stations was prompted by the current use patterns, the threat posed by disturbance and the possibility of predation of the birds. The risk from predation is ever present and sparrowhawks undoubtedly pose a threat and feeders may need to be placed in suitably protective habitat like hedgerows to provide maximum cover when the birds are at their most vulnerable. Cats are also present at the GGC site and may be a serious threat as they undoubtedly are to green lizards and slow worms at the site. Rats and their control were also discussed. The discussion at the meeting echoed the comments by Cath Jeffs on the importance in providing suitable winter feeding habitat if the programme to increase cirl bunting numbers was to be successful (there would obviously be additional benefit for other farmland bird species). 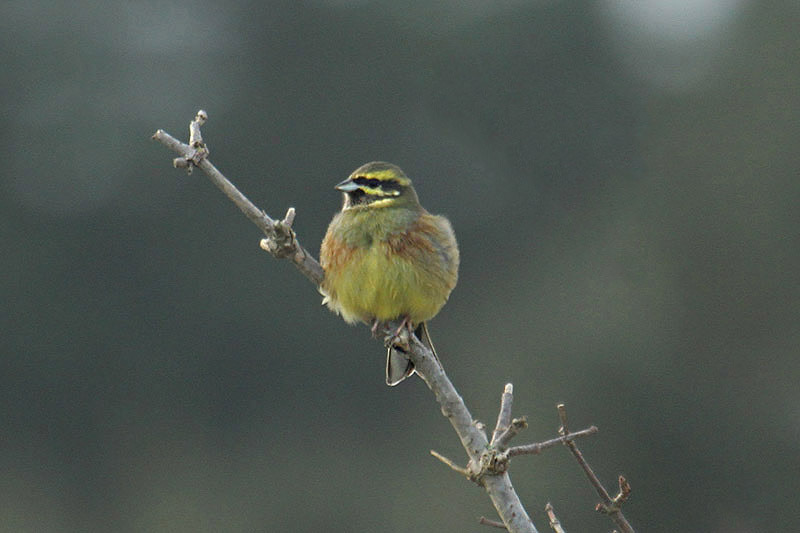 Evidence suggests that cirl buntings favour good hedgerow habitat and associated stubble fields resulting particularly from growing cereals. Suggestions for increasing opportunities of this kind of habitat included looking at Grouville Marsh and surrounding land as well as a more in-depth study to identify marginal / low intensity arable farmland within a 2km radius of the cirl bunting nesting site (2km thought to be the average foraging extent for cirl buntings). It was confirmed that the golf course cirls cross the road to the hay meadow and beyond on Grouville Marsh. This meadow is cut annually Oct/Nov and that this will remain the case thus providing an undoubted seed source. There is also an amount of spring barley currently down in arable land (subsequently used for potatoes) within 2km of the GGC and it will be useful to identify these landowners/tenant farmers to understand their rotational plan and how it could be of benefit as potential food sources for farmland birds. It may be possible for these landowners/tenants to receive financial support, in the form of grant aid through the Countryside Enhancement Scheme (CES), to cultivate cereal crops and provide overwintering feed sources. In addition the targeted improvement of hedgerows could also be supported through financial support from the CES. 4. 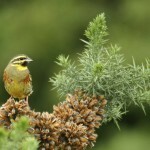 The possibilities for cirl bunting conservation across other localities in Jersey. 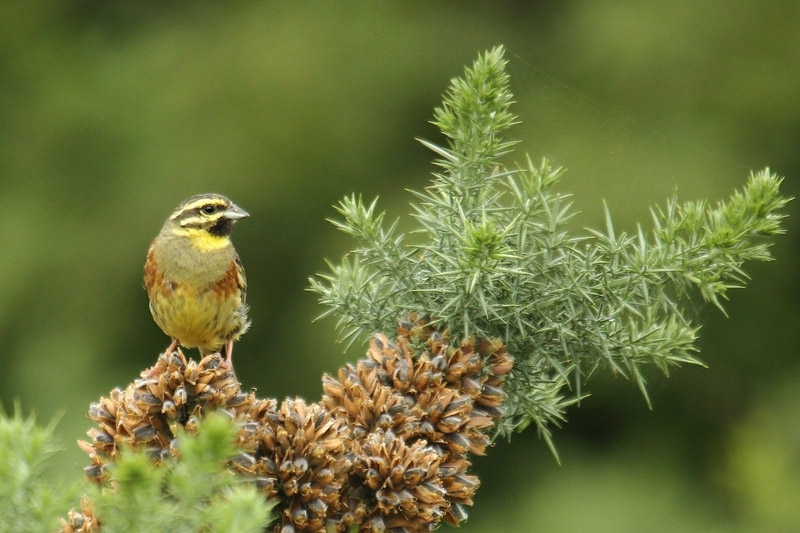 The historic locations of cirl bunting sightings suggest that a more targeted assessment for creating potential winter habitat, that includes feed availability, is undoubtedly worthwhile. At the very least it will provide benefit to a number of farmland birds and raise the profile of this area of conservation. This could include influencing management at Pont Marquet, continuing ongoing discussions with La Moye Golf Course and identifying opportunities on land owned by the States of Jersey.